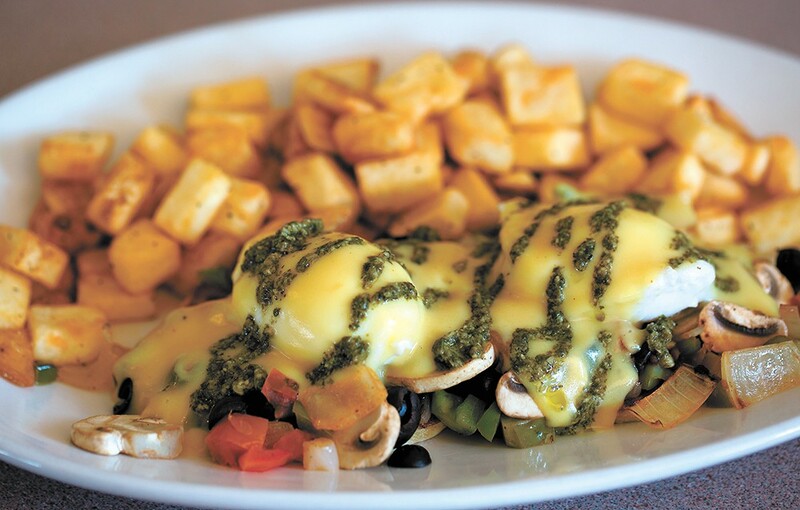 The Veggie Benedict comes drizzled with pesto. If you've ever tried to make hollandaise sauce — the classic French mother sauce of emulsified egg yolk, lemon juice and melted butter — at home and failed, you might agree that sometimes (or most of the time) it's easier to leave this one to the culinary professionals. Thankfully for all the would-be French home chefs, a new brunch spot in Cheney is doing the often tricky sauce justice, with a variety of classic and mash-up eggs Benedicts to choose from ($11-$15/full; $6-$8/half). Opening at the beginning of September, Bene's is a cozy spot on the west end of Cheney's quaint downtown core. Serving traditional breakfast and lunch items, Bene's opens and closes early, with hours from 6 am to 2 pm daily. "I'm all about the breakfast-lunch," says co-owner Derek Baziotis, who runs the restaurant with his wife, Alexx. Baziotis is well-schooled on what makes a good, classic breakfast or brunch — his parents Charlie and Teri Baziotis have owned the longtime Spokane breakfast spot Kalico Kitchen since 2003. Before that, Baziotis says his dad was general manager of a breakfast chain. The newly crowned restaurant owner was essentially raised in the industry — before leaving Spokane to serve in the Navy, and in between other stints, Baziotis worked in the kitchen at Kalico. It's also where he met his wife Alexx. So when the spot on First Street was recently listed for lease on Craigslist, Baziotis says it all clicked. "I've always wanted my own place," he says. "I love Cheney — it's not far away, it's a small town, it's packed with locals and has the college, and it's a great place to be right outside of Spokane." Those familiar with Cheney may remember the building as the previous home of Top of the Line Seafood & Burgers (which is relocating to Spokane and has changed its name to Monroe Street Grill). Of his decision to spotlight Benedicts on the menu — and to name the restaurant after the signature dish — Baziotis says he wanted to capitalize on what he feels is not only a classic breakfast item, but that's also become trendy again in recent years. "I remember cooking at Kalico in 2005 and 2006 when eggs Benedicts got really popular. I remember making eggs Benedict left and right, and I thought 'There is something here, I'm going to open up a restaurant and do crazy and out-of-the-ordinary Benedicts,'" he recalls. The Cali features avocado, turkey and a sun-dried tomato drizzle. 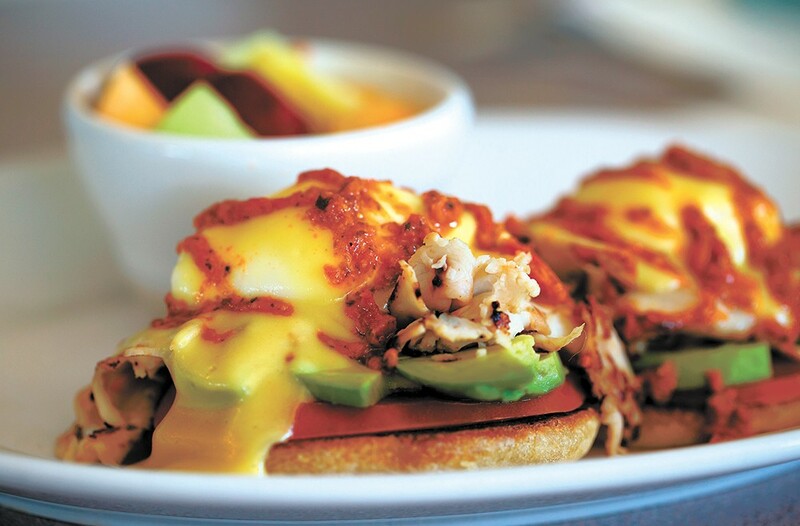 Beyond Benedicts — ranging from a California-style version with turkey and avocado to the "Fireman's Benedict," with Sriracha hollandaise over smoked sausage, roasted pepper and jalapeños — Bene's also serves other morning meal staples: bacon and eggs, sausage, chicken fried steak, hearty scrambles, waffles, and breakfast burritos and sandwiches. For the lunch-preferring crowd (breakfast is served until closing at 2 pm), Bene's serves fresh salads ($8-$11), wraps ($9-$11), a soup of the day, and a selection of sandwiches and burgers ($9-$14).